Last month, the House Ways and Means Committee gave the Duterte administration’s tax reform bill a green light, bringing it one step closer to becoming a law. Under House Bill No. 5636, also known as Tax Reform for Acceleration and Inclusion (TRAIN), the government seeks to collect more revenue by increasing taxes on some consumer goods while restructuring the income tax brackets to give people more bang for their buck. In a report by the Philippine Star, Budget Secretary Benjamin Diokno said that the government eyes a “net gain” of P200 billion once the public offsets the losses from reduced collection with consumption of goods with higher prices. These include automobiles, petroleum products, and sweetened beverages, as well as higher excise taxes on alcohol and tobacco products. Now that the cat is out of the bag, what will the price of goods look like once TRAIN becomes a law? Will a higher take-home pay due to lower income taxes be enough to cover the spike in the cost of some goods? We tried to do the math and see how it went. The current tax bracket used by the Bureau of Internal Revenue is rigged: not only that the Tax Reform Act of 1997 hasn’t been adjusted to the inflation, but it also imposes the same rate on those who are earning, for instance, P500,000 and P2.5 million annually. The new bracketing will be adjusted to the current inflation. It will correct the “income creep,” which means people suffer from higher taxes but get no increase in their purchasing power. How will this affect the salaries of every Juan? To give you a clear understanding, let’s use the average family income provided by the Philippine Statistics Authority. According to the agency’s 2015 records, the average family income of a Filipino household is P267,000, which puts their gross annual salary at around P336,000. Under the current tax bracket, this already puts the salary in the 30 percent group, along with those who earn P500,000 annually. Under the new tax brackets, the P336,000 annual salary will be placed on the second to the lowest tax group, which will earn a deduction of 20 percent and 15 percent in excess of P250,000 in years 2019 and 2020, respectively. In 2019, the net take-home pay of the average Filipino with deductions also factored in will be P308,899.52, with only a total annual income tax of P14,724.88. In 2020 and beyond, the same gross income will be taxed with only P11,043.66, which will yield an annual net income of P312,580.74. This increases the person’s purchasing power by 15 and 17 percent, respectively. Former Tax Management Association of the Philippines president Rina ManuelIn, in a column she wrote for the Manila Times, said that the income tax provision of the government’s tax reform package will address the much-desired income tax reforms, which is helpful especially for low- and middle-income earners. “By calibrating the tax brackets, lowering the tax rates and introducing periodic indexation, we will be able to avoid the current predicament in which salaried workers end up being taxed at unjustly high rates with unchanged tax brackets for the past 20 years,” Manuel wrote. Another component in the tax reform package by the Duterte administration is the excise tax aimed at sugar-sweetened beverages such as powdered juice, energy drinks, carbonated drinks, and other sugary drinks. According to the provision, the TRAIN seeks to impose P10 excise tax per liter on all sugary beverages. So how will this affect your average consumer of soft drinks and other sweet beverages? In 2012, the late Senator Miriam Defensor-Santiago revealed that the average consumption of Coca-Cola products in the Philippines is 151 8-ounce servings annually. This translates to more than 35 liters of soft drinks every year. If an average Filipino spends around P560 every year to buy Coca-Cola, the money spent by people on the said brand of soft drinks will rise to P875 every year. Keep in mind that the numbers still don’t include figures for other soft-drink brands as well as other types of sugary beverage. Petroleum products are also not spared by the massive tax reform program. If the bill goes beyond both legislative bodies and gets the President’s signature, then all petroleum products will also get an excise tax. The said taxes will be imposed on top of the current value-added tax. Despite oil prices are going back to higher rates, the government is adamant at pursuing this. 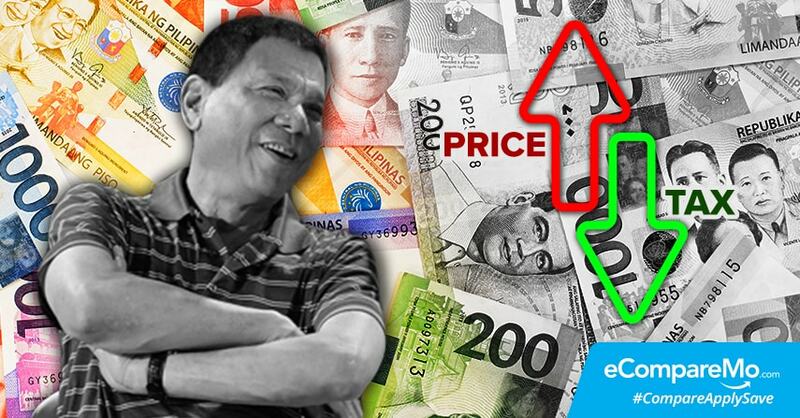 According to Diokno, these taxes will be necessary if the government aims to accomplish its massive infrastructure dream that will cost somewhere between P8 and 9 trillion and will be finished by the time Duterte leaves Malacañang in 2022. Under TRAIN, the excise tax imposed on gasoline will be raised from P4.35 to P10 per liter. Meanwhile, other products such as diesel, cooking gas, kerosene, and bunker fuel for power plants will be slapped with P6 per liter—note that these products didn’t have excise tax before. Aviation fuel taxes will also increase to P10. “There is no excise tax on diesel, though it is subject to the 12-percent VAT like other oil products. I think this should be corrected,” Diokno said in a report by the Philippine Star. With the increase in purchasing power of the people via lower income taxes, Diokno is confident that the additional amount to petroleum products will not be a problem once the comprehensive tax reform takes full effect. How will the prices move once the petroleum excise tax starts to take effect? Take a 2016 Honda Civic 1.8 E, for instance. The Civic’s total fuel tank capacity is 47 liters. Let’s say that the price per liter of a regular gasoline is around P45 per liter. This means that whenever someone gets a full tank from 0 to 47, the price of a full tank with the new excise tax rates in effect will be P2,366.45, as opposed to the current total price of P2,115. While owners of private vehicles may be able to take the slight increase in the price of their gasoline, it’s a different story for jeepney drivers. Since most jeepneys are equipped with old diesel engines that are not as fuel efficient as their modern counterparts, drivers who are still using older types of jeepneys may take a huge blow in their take-home pay. This, however, can be addressed once the PUV Modernization Program takes effect and the public utility vehicles start to come with more fuel efficient and Euro 4-compliant engines. What do you think of the Tax Reform for Acceleration and Inclusion bill? Share your thoughts in the comments.